Since at least the 1980s, much research, policy and practice in the field of physical education for girls has been trapped in a repeated lament that we have yet to find the solution to ‘the problem’ of girls’ lack of participation in physical education and consequent negative effects on their health and wellbeing. The narrative builds upon dominant progress and loss stories, which have cemented a stock account of the history of the female tradition in physical education in a fixed temporal entrapment. It describes how women in England led the field in establishing and maintaining the profession from the late 1800s only to lose their power and authority in the decades following WW2 to a burgeoning male physical education profession. This mid-20th century move from female to male dominance in physical education has been described as one of the most striking phenomena of recent educational history. Five years ago, Richard Reiss, the physical education teacher at Public School 197 in Far Rockaway, Queens, went to the principal with a problem: not even the most athletic among his students, most of whom are poor and black or Latino, had enough endurance to run a mile. The once-a-week physical education classes the school offered, far from what was needed to fulfill the minimum requirement set by the state, were not cutting it. Mr. Reiss suggested starting a walking club, then found out about something better: a free program led by New York Road Runners that is now operating in 450 schools across New York City and provides prizes based on miles logged. P.S. 197’s 550 students, from prekindergarten through fifth grade, still have regular physical education classes only once a week, but 40 fourth- and fifth-grade pupils show up daily for the optional program at 7 a.m., 80 minutes before the first bell. 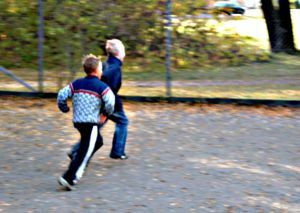 Most states mandate physical education from kindergarten through 12th grade, with New York and five others — Illinois, Iowa, Massachusetts, New Mexico and Vermont — setting minimum amounts of instructional time, according to a report by the National Association for Sport and Physical Education released last year. New York requires 120 minutes a week through sixth grade, and at least 90 minutes a week for seventh and eighth grades, but a recent audit of 31 elementary schools by the city comptroller, John C. Liu, found that none of them were in compliance. Principals and other education officials say the combination of budget cuts and testing pressures have relegated physical education to the dispensable category, despite city and federal efforts to combat obesity and improve health by promoting nutritious foods and frequent exercise. But some teachers and principals have gotten creative to prioritize movement during the school day, stretching money, space and time to fit in exercise wherever they can. To read the rest of the New York Times article click here.